Dr. Suhas Haldipurkar, Chief Trustee of Laxmi Charitable Trust started his private practice in Panvel in year 1981. Looking at the need for sustainable, affordable and high-quality eye care for the rural indigent population, he started once a week charitable OPD in his private practice in 1996. 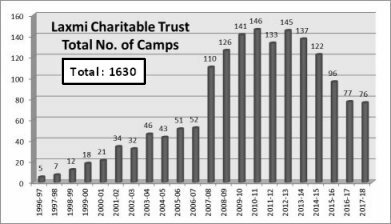 But the need was so great that this charitable OPD was not sufficient, and he decided to establish a separate charitable hospital. 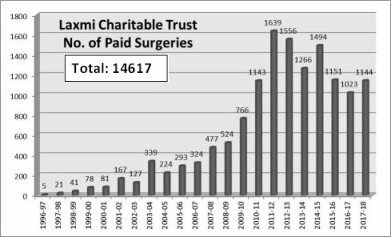 The Laxmi Charitable Trust eye hospital was thus started in the year 2000. We had already started conducting camps in nearby villages to diagnose cataract patients and bring them for surgery at our base hospital at Panvel for surgery from 1996. 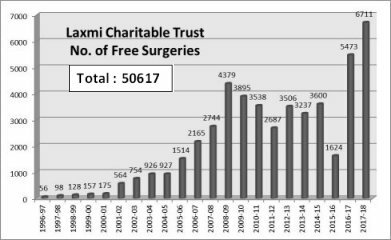 In the last 20+ years, we have come a long way, from 56 free surgeries in the year 1996, to more than 6000 free surgeries in a year. Of course, this is an entire process which includes providing free transport to patients from their village to the base hospital at Panvel and back, their stay in Panvel for 3 days, their meals, pre-operative, intra-operative and post-operative medicines, and dark glasses. We have realized that we are presently catering to only the tip of the iceberg. We need to work on a much larger scale if we have to eradicate avoidable blindness in our district. To do that, i.e. tackle 700,000 cataracts in Raigad district, we need to increase our patient handling capacity, which in effect means hiring more staff, purchasing more equipment, and strengthening the present hospital to a Tertiary Eye Care Center. This is a herculean task. Mazgaon Dock Shipbuilders Ltd. agreed to fulfill our dream by providing a grant for building the infrastructure and purchasing equipment for this hospital. We are now coming up with a state-of-the-art operation theater complex with the latest technology for surgeries, and the latest equipment for examination and diagnosis of eye problems in our OPD. Both the hospital floors will be completely renovated in a manner that will allow us to almost double our capacity of handling patients.